Congratulations to all our dancers on their wonderful performances during our 2018 recitals, “Land of 10,000 Dances” We are proud of our dancers and their hard work throughout the 2017-2018 season. We would like to thank all the parents for everything you do to support the dancers and teachers and we are looking forward to another fun year of dance at WDC. There were multiple items left at the high school over recital week. Missing something? Please check the recital lost and found at the front desk. Thank you! We have two summer sessions for dancer ages 2 and up. Please see the dates below and click on the link for more information about our summer classes and to register. As a reminder, summer classes for boys only classes are only offered during the second session. If you have any questions about summer classes or registration, please contact our front desk at (651) 735 – 9252. Click HERE for the complete summer schedule and class descriptions. We are offering multiple one day dance camps this summer! Each day runs from 9:30am – 1:00pm. Please see the dates and camp themes below. Click HERE for more information about summer dance camps and to register. Interested in the WDC Competition lines? It’s not too late to register for auditions. Below are the dates for auditions. If your dancer is interested in auditioning for a competition group please click HERE for more schedule and audition information. Class pictures were taken in costume back in April. 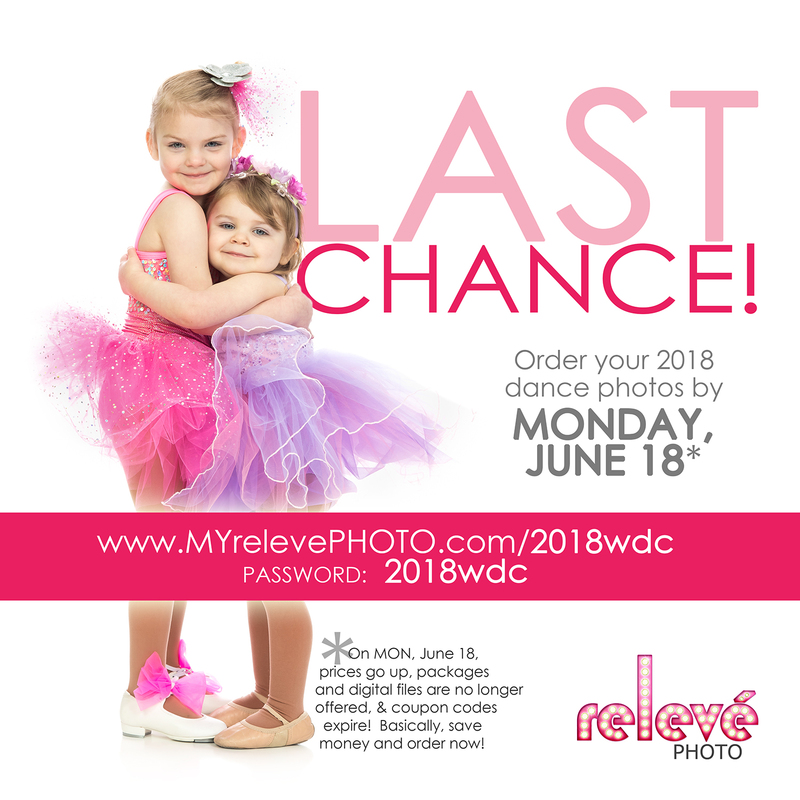 As a reminder, pictures may be ordered online using the link below through Sunday, June 17th (prices go up on Monday, June 18th). 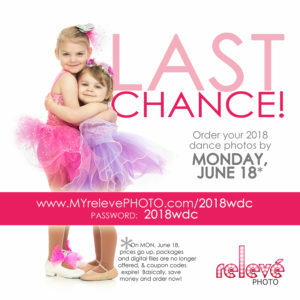 Recital DVDs will be ready to pick up at the studio starting Wednesday, July 18th. If you have not yet ordered a DVD and would like to do so, below is some ordering information. DVDs are $29.95 until June 23rd – any order after June 23rd, DVDs are $39.95. We will be hosting a garage sale/shoe sale in August/September to support our Darby’s Dancers Program. Darby’s Dancers offers free dance classes to dancers with special needs. We encourage parents to save their dancers used shoes and dance wear to donate to the sales later this summer and help support Woodbury Dance Center’s Darby’s Dancers. For more information about our Darby’s Dancers Program click HERE. Below are our summer hours. Mondays 1:00 p.m. to 9:00 p.m.
Tuesdays 9:30 a.m. to 9:00 p.m.
Wednesdays 9:30 am. to 9:00 p.m.
Thursdays 9:30 a.m. to 9:00 p.m. The studio will be CLOSED on Monday, July 2nd – Sunday, July 8th. Don’t forget to register for classes for the 2018-2019 season! Classes are filling up quickly. Click HERE to view the schedule. You can register for classes online at our website woodburydance.com. Look for information that will be sent out soon about “Back to Dance Sales.” The Back to Dance Sales will be in August in our Boutique, where you can come in to order/purchase shoes and dance wear at a discounted price before the new season. Our 2018-2019 season will begin on Friday, September 7th.